Since we are watching bald eagles and peregrine falcons, I wanted to talk a little bit about body plans and their influence on flight, hunting, and prey base. As watchers know, eagles are soaring generalist hunters that eat almost anything they can sink their talons into, while peregrine falcons are energetic, acrobatic flyers that specialize in catching birds in the air. Both are birds of prey, but their body plans and wing shapes result in very different lives. With their long, broad, slightly rounded wings, large wing slots, and broad, wedge-shaped tails, bald eagles are built for soaring. They hold their wings flat and save aerial acrobatics for hunting and encounters with other birds. While tail winds and thermals aren’t absolutely necessary for eagle flight, their migration corridors and styles take advantage of both. Thermal winds are powered by sunlight, which means that eagles migrate during the day. They also tend to prefer wind corridors, including ridgelines and funnels that concentrate and amplify wind – think of the cliffs of the Mississippi river or the tight river valleys and ridges of NE Iowa. A stiff tail wind will send migrating eagles aloft in their thousands, especially over surfaces with little opportunity for thermal soaring. The Bald eagle body plan and low-aspect wings - large, broad wings relative to its overall surface area - is most suited to low-angle, low-energy soaring flight. Unlike bald eagles, Peregrine falcons are built for speed and maneuverability. They have long, narrow, pointed wings and long tails shaped for diving, twisting, and turning in flight. Where eagle flight is flat, peregrines often fly in a series of arcs as they dive, dash and pursue other birds in flight. 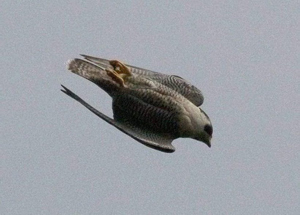 The peregrine body plan and high-aspect wings - narrow, pointed wings relative to its overall surface area - is most suited to high speed, energetic and often acrobatic powered flight. Although I don't confuse falcons and bald eagles, I often find body plan and flight style to be very helpful in identifying similarly-sized birds of prey at a distance. Is it large and flying flat, holding its wings in a vee and tilting as it flies, or M-shaped? If you are in northeastern Iowa, the first is probably an eagle, the second is probably a turkey vulture, and the third is probably an osprey. Are the wings large or small in proportion to the rest of the bird? Are its wings pointed or rounded? Is its tail long or wedge-shaped? Is it flapping and gliding, diving, hovering, or quartering low over a field? Did you see it in the woods or in the open? Body plan, behavior, and habitat are very helpful in identifying birds of prey, especially at a distance. In general, all birds of prey have keen vision, talons, and curved beaks to help them hunt, kill, and eat prey. But not all beaks, talons, and hunting styles are the same. The peregrine falcon’s speed and maneuverability makes it uniquely suited to catching birds in flight, while a bald eagle’s size, strength, powerful feet, and long talons make it an excellent generalist hunter. Both birds take full advantage of their very different body plans when it comes to catching and eating prey. A peregrine falcon’s speed and maneuverability allow it to fly high, dive steeply, and hit prey so hard that the force of impact severs its prey’s spinal cord. A peregrine begins its dive by rolling, cupping its wings around its body, and tucking in its feet, yielding an aerodynamic raindrop that slices through the air at high speeds. Special cone-shaped bones in its nostrils – an adaptation unique to peregrine falcons – allow it to breath while diving at speeds of over 200 miles per hour. As the falcon approaches its prey, it extends its feet, brakes sharply, and snatches it out of the air with its long, slender toes and sharp talons. If hitting a bird doesn’t kill it, peregrine falcons use their tomial tooth – a special notch in their beaks that bald eagles don’t have – to sever their prey’s spine. While a peregrine’s feet are strong and quick – great for grabbing and slashing attacks – they don’t have the crushing strength of a bald eagle and their diet is largely restricted to other birds. A bald eagle’s large size, soaring flight, and strong feet help it to take a wide variety of prey, although its speed of attack is slower, its angle of attack is lower, and it usually kills prey with its feet. As we’ve seen at the fish hatchery, Mom and Dad swoop shallowly over the retaining pond, braking heavily as they plunge their feet into the water and pull out trout. Without stopping, they fly into a tree, on to the bluff, or into the nest, crushing or stabbing the trout with their powerful feet and sharp talons. 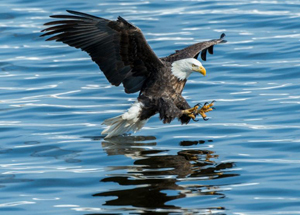 Although they have special adaptations called spicules – rough bumps that help them grip slippery fish - bald eagles don’t specialize in any one kind of prey, and their size, strength, powerful feet, and fishing ability give them access to an extremely wide prey base. Again, falcons and eagles are very different and I don't confuse the two, even at a distance. But understanding how body plans influence birds is useful to understanding their lives and identifying them in the field. I find it to be more helpful overall than looking for hard to see features, especially if a bird is far away. Hashtag #musing: could body plans impact gregariousness? Off their breeding grounds, bald eagles are quite gregarious. Their flashy colors, large, visible body plans, and wind-seeking behavior often bring them into proximity with other eagles. Eagles compete (think piracy and kleptoparasitism) but they also eat a wide variety of prey and often benefit from following other eagles when searching for food. As far as we know, peregrine falcons are loners. During migration or following dispersal, there can be multiple peregrines in a site with an abundance of food. However, they aren’t gregarious. Perhaps their more solitary behavior is driven in part by a body plan that results in a restricted prey base (leading to serious food competition), no real benefit to stealing or attempting to steal food, and less congregation around important dynamic and thermal soaring points. A turkey vulture "V" is more correctly referred to as a dihedral. Turkey vultures are masters of soaring without flapping as they ride the wind in search of carrion. How do they do it? As wind strikes one wing or another, tipping the vulture right or left, one wing tips high and the other tips low. Wind flows under the low wing, pushing the vulture and righting it until it tips again. This allows them to exploit the smallest of air currents as they soar lowly and slowly through the sky. While they sacrifice some maneuverability, their food - carrion - doesn't require agility to catch. And finally, I've seen some interesting conundrums when people compare birds to aircraft. Remember that aircraft can't change their shape to respond to wind conditions or the need to rapidly change position. But birds can and often do change shape as they fly! 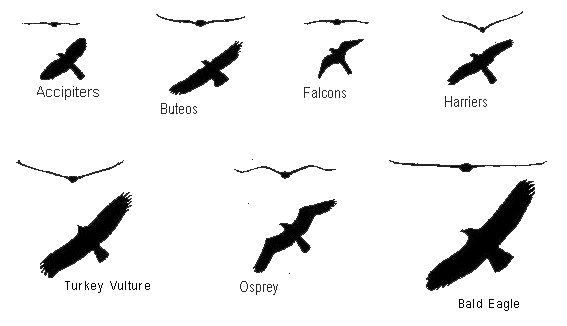 I chose silhouettes that I thought best represented each bird overall, but birds might adopt different flying styles under different conditions, even if they can't change their overall body plan. Watching birds. Read, learn and apply in the field! There is nothing like a few hours of playing 'turkey vulture or bald eagle' in Decorah to hone your ID skills! What's inside those bald eagle eggs?